Ita��s been 20 years since Lufthansa began taking off from Chennai. To celebrate, the airlines is giving something back to its customers. 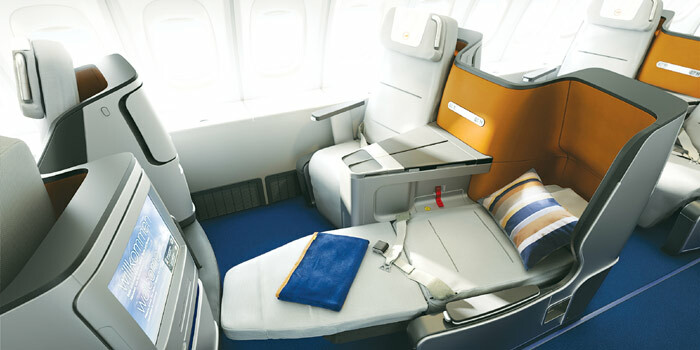 Now business class passengers on the Chennai-Frankfurt route can relax on full-flat beds that promise comfort and privacy. a�?At the touch of a button, the seats convert into beds measuring 6.5-feet. They have ergonomically-improved cushioning and more space at the shoulder level, thanks to lowerable armrests. Also, adjustable headrests and additional compartments create a new level of comfort,a�? says Wolfgang Will, director, South Asia Lufthansa. Whata��s more, you dona��t have to stand up each time you adjust the seats; its intuitive mechanism continuously adjusts to the body during the shift. A lot of customer feedback (through surveys and passenger testing) was taken into consideration before designing the new business class. a�?One of the wishes expressed was to sit/lie facing the direction of travel. So the seats are arranged in the form of a V’, with two neighbouring seats angled towards one another along a central axis,a�? says Will. The in-flight entertainment system has been revamped, too, with individually adjustable 15-inch screens and a wider range of choicea��100 films in eight languages, 200 TV programmes and 30 radio channels. As for food, Lufthansa now offers a a�?themeda�� cuisine, which is changed every two months. Lufthansa, of course, is not the only ones offering such luxury. Check out Jet AirwaysA� on their Chennai-Brussels route and Emirates on their long-hauls to the US.